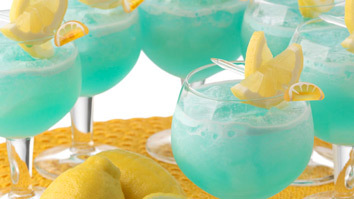 Electric Lemonade is a powerful and delicious version of the old country favorite. But don’t think of “Grandma on the Farm” when you mix up this baby. This one will knock your socks off and refresh you all at the same time. This will make a small pitcher full of cocktails or you can make it in a blender. In a pitcher or blender, put the frozen lemonade, water, vodka, simple syrup and Blue Curacoa. Mix well. Add some crushed ice to each glass and fill with lemonade mixture. Garnish with a lemon slice. You can also serve this right from the pitcher or blender along with your cool cocktail glasses filled with ice. Serve and Enjoy ! *Non-alcoholic recipe: follow recipe from above but omit the vodka and Blue Curacao. Replace it with 4 oz of blue raspberry cocktail mix. If you like your lemonade a little tart, omit the simple syrup. Serve and Enjoy !